Shortly before Christmas, the “Dartmouth Memes For Cold AF Teens” Facebook group started to buzz with memes about receiving three citations for the fall term. Henry Mans ’23 wanted to go to college in a small town connected to nature. A recently-accepted student from Edina, Minn., Mans said that Dartmouth was his first choice school because of its size, location and academic strength. “It was big for me to be in a more rural place,” he said. Dartmouth community members will be able to use Google applications through their official College accounts following a recent decision to offer Google’s G Suite campus-wide. According to College vice president and chief information officer Mitch Davis, the decision to offer Google applications was informed by the expressed interest of faculty members. Veterans around the country should give more consideration to the Veterans Health Administration’s services when choosing where to receive medical care, according to a recent study on the merits of VHA and non-VHA facilities published in the Annals of Internal Medicine at the end of 2018. Researchers from The Dartmouth Institute for Health Policy and Clinical Practice and the White River Junction Veterans Affairs Medical Center worked on the study. Vinay Reddy ’20 has been appointed as The Dartmouth’s interim publisher. He previously served as the assistant director of communications and marketing. Reddy will be replacing editor-in-chief Zachary Benjamin ’19, who has been serving as acting publisher since November. As most Dartmouth students finished exams and began their winter break, three classes reconvened after Thanksgiving to travel abroad for the culminating experiences of their fall term courses. Economics 70, “Macroeconomics Policy in Latin America,” traveled to Argentina and Chile, Public Policy 85, “Topics in Global Policy Leadership,” went to Colombia and Biology 70, “Biologic Lessons of the Eye,” visited India. Students were accepted into each course based on an application explaining why they wanted to be in the class and how it related to their course of study. Students will now have to order all their textbooks online following another bookstore closure in Hanover. In an organized show of support for the plaintiffs in the pending class action against Dartmouth, nearly 800 alumni, current undergraduate and graduate students, faculty, staff and other members of the Dartmouth community have signed a letter condemning “an institutional culture that minimizes and disregards sexual violence and gender harassment.” The letter comes from a group calling itself the “Dartmouth Community Against Gender Harassment and Sexual Violence” and urges that members of the College’s leadership “acknowledge their glaring breach of responsibility, issue a public apology, and begin a transparent overhaul of regressive practices.” Addressed to College President Phil Hanlon and the Board of Trustees, the letter was originally delivered with over 500 signatures on Dec.
Dartmouth has welcomed 574 students to the Class of 2023 via early decision, compared to 565 last year. Kevin Figgins Jr. ’16 passed away unexpectedly on Dec. 2, College President Phil Hanlon announced in an email to campus Monday afternoon. For a decade, Ruth Cserr ’88 has been a regular donor to Dartmouth. But in the wake of the pending sexual harassment class action against the College, which accuses three former professors in the psychological and brain sciences department of repeated sexual harassment, assault and misconduct, that is no longer the case. 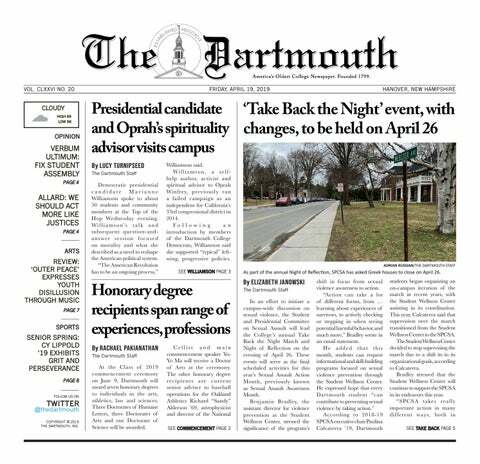 Seven women have filed a $70 million federal class action lawsuit against the College alleging that Dartmouth ignored more than 16 years of sexual harassment by Todd Heatherton, William Kelley and Paul Whalen, three former professors in the psychological and brain sciences department. Lev Grinberg is a visiting professor in the anthropology and sociology departments, hailing from Ben-Gurion University in Be’er Sheva, Israel. Two days after the Nov. 6 midterm elections, a panel of four Dartmouth professors spoke to an audience of over 100 people about the results. Hanover’s cold winters will soon no longer freeze the training schedules of Dartmouth’s sports teams. Dartmouth had a packed schedule this year to celebrate Veterans Day, including ceremonies, discussions and events. Augmented reality is poised to have a bright future. Researchers at the College have developed battery-free, eye-tracking glasses that could be particularly useful for enhancing existing AR technologies. Phyllis Deutsch became a lecturer for the Institute of Writing and Rhetoric in 2017 after retiring from her position as the editor-in-chief of the University Press of New England.